This document will guide you through a process of how to trim a Science Olympia (SO) glider. This is not the only way an SO glider can be trimmed to fly, but the way I would trim a balloon launched glider to fly. In the reading of this document, you should assume that left and right is always referenced from the perspective of you sitting in the model looking out of the front. After I construct the glider and are about to trim it out, I look over the model and make sure the following things appear to be correctly configured. Looking at the glider, check the following. a) Is the fuse straight? Make sure the fuse is not bending to the left or right. b) Are the wings twisted? If washout has been built into the model, are the right and left wing panels twisted equally? c) Is the rudder slightly off the fuse center line? The front (leading edge) of the rudder should be on the center line of the fuse. The trailing edge should be set off .032" to the left. I trim my gliders to turn left. d) Is the elevator horizontal when the wings are held level? This is looking for stab tilt, which many modelers use to turn the model. I only use stab tilt if other procedures fail to produce a left turn. e) Is the rudder perpendicular to the elevator? Looking at the glider from the side, check for the following. a) Hold the model so the elevator is level. Is the wing's leading edge about a quarter inch higher than the wing's trailing edge? b) Is the fuse stiff enough that the stab is not sagging? Find and check the balance points of the model. a) Are the wings balanced? The left wing should be slightly heavier than the right, to help the glider turn left. b) The balance point (CG) should be between 30-60% back of the leading edge. After all these things have been checked and corrected, we're ready to give it a light hand toss. We have set the glider to turn left. (Rudder offset left and a heavy left wing.) I start the trimming process by giving the model a light hand toss. Wing banked slightly to the left, about 10°, and nose level. The plane should glide in a left circle. If the glider doesn't fly level, or descends at a constant speed, you must trim the model to do so. The model must not stall or dive. This can be tricky and you must observe it carefully. If the nose of the model comes up as the speed is reduced, or as the plane slows down, this is a stall. After a stall, comes a dive. If you miss the stall, and the model does not have enough height to stall again, you could make the wrong conclusion that the model is diving, when it actually is stalling. Adjust the glider by adding or removing clay from the nose. When the model is stalling, add clay. When the model is diving, remove clay. After attaining a level glide, by removing or adding clay, you should recheck the CG and make sure it is within the parameters of 30-60% back from the leading edge. If it's not, you will have to add more or reduce the incidence of the model, or install tab trim in the elevator. To put tab trim in the elevator, bend the last 1/8" or so of the elevator up or down. You will need to heat\moisturize the wood by breathing on it, or the wood is likely to crack. If you need up elevator, you add it on the left side. If you need down elevator, you add it on the right side. This will assist the glider in turning left. After much repetition in this process, you should be able to get the model to fly level or at a constant descent rate. Now is it turning left? If not, then a left turn needs to be added. You have four methods you can try. Add clay to the left wingtip, thereby making the left wing heavier than the right. I try to avoid using wingtip weight to make a model turn, but it does work. Tab tilt will make a plane turn. So, if you need it to turn left, you have to tilt the stab so the left side is higher than the right, when the wings are held level. Rudder is the next thing to try, but rudder can get you into trouble very quickly. Too much rudder will cause the plane to wind in. When you watch the model glide, try to observe whether the glider is yawing to the left. I try to stand behind the model as it is gliding, and observe the tail very carefully. The model's tail should appear to be sliding to the right. The nose of the glider will be sliding to the left. But since the nose is shorter than the tail, you can see the tail sliding much more easily. If you can see a slight yaw to the left, then the rudder is probably set correctly. Finally, if the model is still not turning left, add some left aileron. You do this by twisting and raising the leading edge of the left wing tip up. Since the left wing is a frame covered with plastic, the whole wing must be twisted. Sometimes, glue joints need to be broken and reglued. After you get the model turning left, more than likely, it will be stalling or diving again. You will have to repeat the glide trimming process of adding and removing clay, as described previously. Finally, you should have the model gliding nicely in a left circle. After obtaining a proper glide, it's time to launch the model off a balloon. I suggest a small rack which is made from thick paper, taped to the balloon. The paper is shaped like a small cylinder standing upright, about 8" in diameter, with cutouts for the fuse so the wing sits on the paper cylinder. The purpose of this rack is to keep the wings banked about 10 degrees to the left and the nose level. You want the glider to come off the balloon at the same attitude as you were testing it at. You don't want it to come off the balloon at weird angles or with the nose down. The balloon needs to be about 30" in diameter when filled with helium, and a string is attached to control the balloon's height. Prepare for launch by simply putting the glider on the rack, and slowly raising the balloon to the top of the building. To launch, just quickly lower the balloon down about two feet, with a light tug on the string. Now, the glider should be flying. The first couple seconds of the flight, are very important, and typically the most difficult to trim and correct. If the glider dives toward the ground, then you did not have enough incidence in the wing, or enough up tab in the elevator. You can either add incidence to the wing or up tab, to correct the problem. Sometimes, one method works better than the other. I watch the speed of the glider carefully, and adjust accordingly. To understand which way incidence or up tab is needed, one must understand how these adjustments change with the speed of the glider. Below is a general chart that I use when deciding whether to add or subtract up tab or incidence. 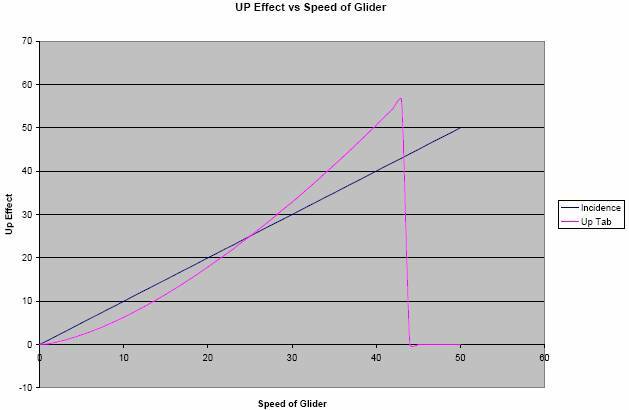 I am defining "up effect" as the sensitivity of the glider's nose to come up or level. The numbers on the x and y axis are arbitrary and unit-less. So you can see that if the glider is at a low speed or if the glider is at a high speed, you add incidence to get the glider's nose up. If the glider starts out slow, and its speed continues to increase, then up tab is needed. It should be noted, that at some speeds, up tab just stops working and has no effect. I theorize that this is due to knowing that at some speed the air across the surface actually deflects the tab back to neutral. You can usually use up tab to pick the nose up, but at extreme speeds (very low or very high) you will need to use incidence, as up tab doesn't have as strong an effect. Now, after initial release from the balloon, if the glider comes down in a spiral turn, you have too much rudder. You need to remove some left rudder and try to turn the model using one of the other three methods we previously discussed. In conclusion, look over the glider and constantly make sure everything is straight and warp-free. Also, make sure nothing is broken or cracked. If you are even slightly suspicious that something is damaged, you should hand-toss the glider again, just to be on the safe side and make sure it's gliding correctly. If it does not glide correctly on a hand toss, it will definitely crash off a balloon launch. Finally, the glider needs to be trimmed, so it can recover from somewhat of a poor starting attitude. Good luck! I hope this document was helpful!